Universal Studios Japan brings wholesome to gruesome at their unique Universal Surprise Halloween event. Get all the info you need in this complete event guide! This year, Universal Studios Japan (USJ) will redefine their popular Halloween event with all-new adventures and the return of fan favourites. Billed as the “New Era of Halloween”, Universal Surprise Halloween is split into three distinct experiences, offering spooky fun for all guests. The seasonal programming spans the entire day, with halloween attractions opening progressively throughout the day. The park doesn’t close and sweep guests out in the evening. With the exception of special experiences that are separately charged, halloween attractions are included with park admission. Guests are allowed to dress up in costumes and wear masks, as long as they abide to the park’s rules. 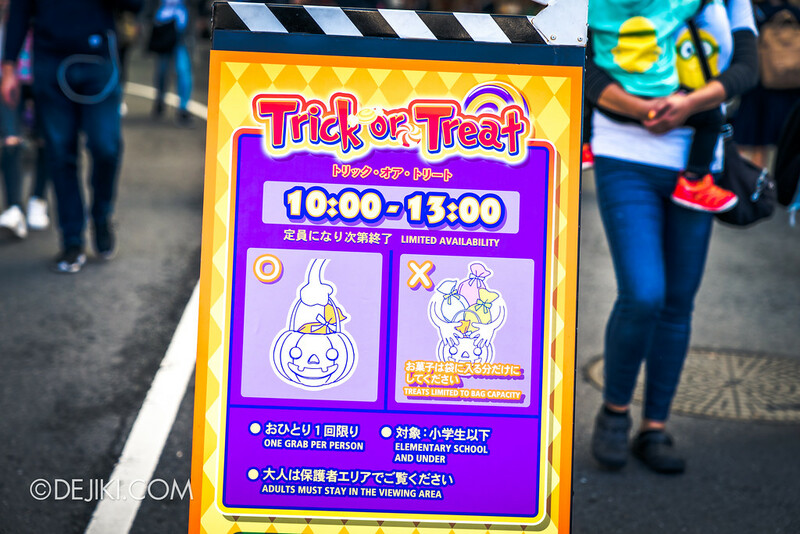 Note: This is a very long post because it is a complete trip planning guide for USJ Universal Surprise Halloween 2018. 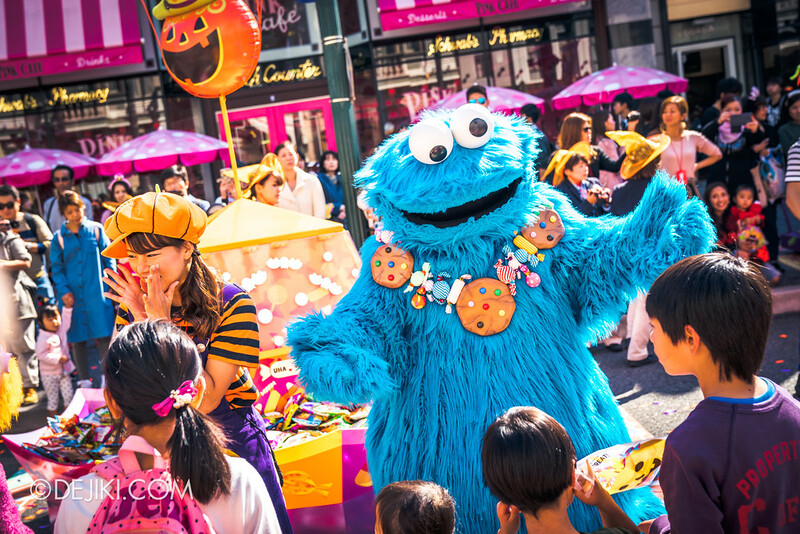 Take your time to discover the three kinds of Halloween in USJ! Haunted house-style attractions in USJ are referred as horror mazes. I will use that term here for consistency. Dress up for 大人ハロウィーン (Otona Halloween), an all-new sophisticated and dramatic Halloween experience catering to adult park guests. An additional ticket is required to experience this attraction. Become part of a murder mystery as you explore the glamourous Hotel Albert and uncover its dark secrets. Guests will be roleplaying as characters and interacting with the performers as part of the experience. If you dare to explore Hotel Albert, you will spend some 80 minutes to experience the elaborate narrative within a 4-storey complex (Stage 18). Important Note: This attraction is rated R15 – for ages 15 and above only. As part of the experience, there are scenes where performers will touch guests. To fully enjoy this experience, guests should be able to understand and converse in Japanese. Waiver/ Pledge: Guests will need to sign a “pledge” document to enter this attraction. The pledge comprises an agreement to abide by the attraction’s rules, including non-disclosure of the attraction’s content. Guests with conditions that may be aggravated by effects (including Fog/Smoke, Strobe lights, Water, Loud sounds, darkness, odours, and physical contact) – are advised not to participate for their safety. Please note that the park does not offer refunds, so only buy tickets if you are well and able to experience this attraction. Chill out at Hotel Albert’s Lounge and get your fashionable looks captured at this exclusive photo spot. A VIP section is available for guests who have participated in the Hotel Albert horror maze. For other guests, an additional ticket is required to access the lounge. An ‘entry ticket’ is required to experience this attraction. Silence is essential to avoid being hunted by the ghosts that lurk this haunted ship. Hold back your screams and remain calm as you explore and hopefully escape this mysterious vessel – and survive all 5 minutes of it. Think of it as ‘A Quiet Place’ on a ship. ‘Entry ticket’ is required to experience this horror maze. Tickets will be distributed at the Battery Park (the small park beside the park’s lagoon, across from Mel’s Drive-In). If tickets have run out, guests will need to purchase Universal Express Pass (if still available) to experience this attraction. This horror maze will share the same building as Hotel Albert. Particularly, the same area housed the famous TRAUMA 3 horror maze last year. There is so much space that TRAUMA 3’s final scene, the maze-like corridors out of the prison lab, felt much larger than most haunted houses in Singapore. Catch this “mesmerisingly beautiful” show about vampires which takes place in the legendary lair of one. This 10-minute show uses 4-D theater effects and thus should be showing inside the park’s CINEMA 4-D attraction in the Hollywood zone. The Halloween Horror Nights that we’re all familiar with, screaming loud and all, is called 絶叫ハロウィーン (Zekkyo Halloween) in Japan. Premiering in Japan is the Insidious: The Last Key horror maze, based on the film released earlier this year. It will be built at the Palace Theater soundstage – the same space where two houses were staged in 2017. So you can expect either larger scenes or a longer experience for Japan’s Insidious maze. An entry ticket is needed for this attraction, which will be distributed at Stage 14 (USJ Annual Pass Center, across the street from Mel’s Drive-In) from when the park opens, until tickets run out. Thereafter, the only other way is to buy Express passes. 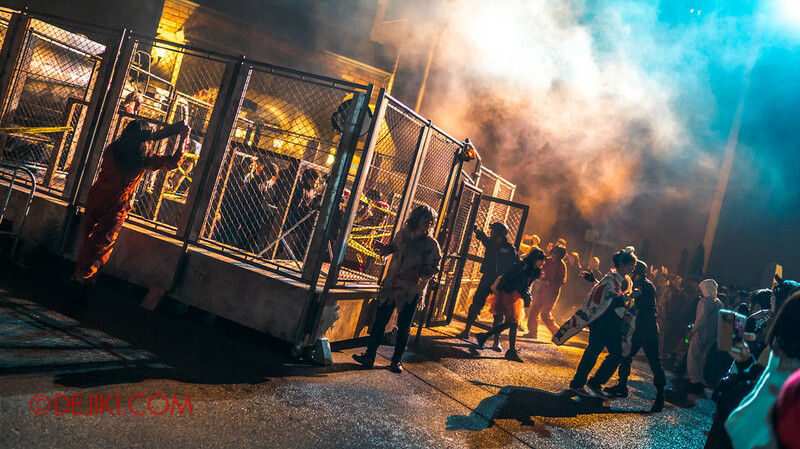 Learn how Japan’s HHN timed entry tickets and express passes work in my 2017 event coverage. Chucky is back in Japan for the fifth time, and last year’s Cult of Chucky is making a comeback. Return to Harrogate Hospital (now at its new home in Stage 33) where countless Good Guy dolls have completely taken over the wards. Read about the 2017 Cult of Chucky horror maze here. In this outdoor horror maze, only the strong, decisive, wise (and lucky) will complete their mission and survive! This year, USJ will be adding some giant mutated monsters for you to scoot away from. Looks like the one from 2017’s TRAUMA 3’s epic finale escaped here. Catch a glimpse of the original Deadman’s Forest (2017) here. Witness the curse of SADAKO (from リング The Ring) as she haunts the Terminator 2:3-D theater! 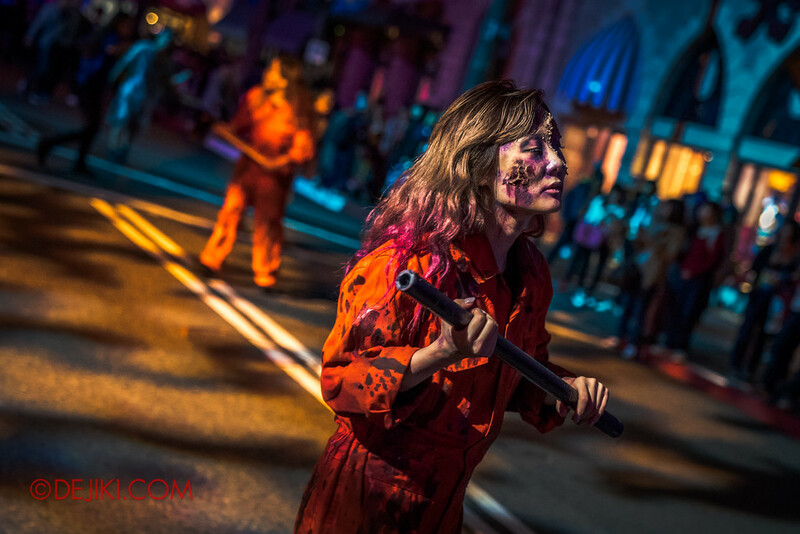 Mind-boggling varieties of zombies will prowl the streets in many areas of the park. Beware of zombies lurking in Hollywood, New York, San Francisco, Jurassic Park, Amity Village. Only these areas are safe: A section of Hollywood zone (leading to the park exit), Minion Park, Universal Wonderland and the Wizarding World of Harry Potter. And here comes the family-friendly こわかわハロウィーン (Kowa Kawa Halloween) That’s a word blend of “Kowai” and “Kawaii”, which basically means this particular Halloween is “not-so-scary and way-too-cutesy”. As USJ has age restrictions for certain horror attractions, this is an option for young families to take part in Halloween festivities. 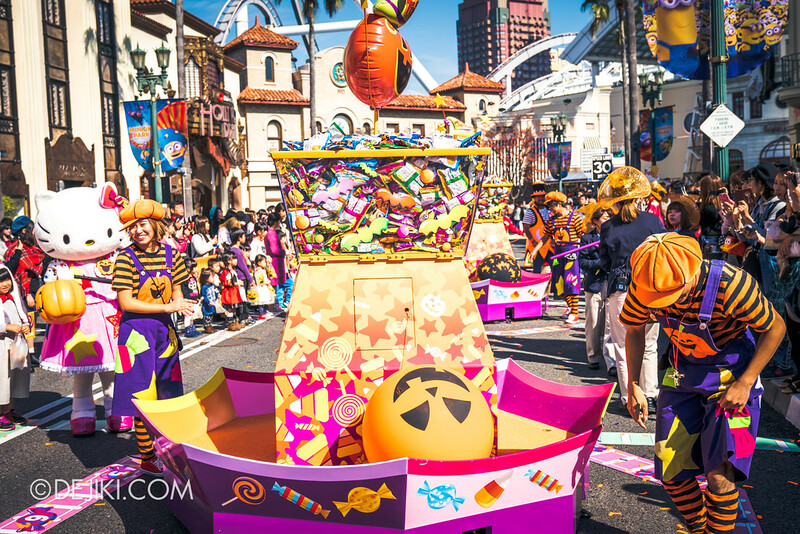 This Mardi Gras-inspired Halloween parade is returning again with upgrades! You can even be in the heart of the bustling celebrations with a Special Area Ticket for a ‘360-degree’ surround party zone with the Halloween Franken-Minions. This special party area is held at the GRAMERCY PARK (New York zone). 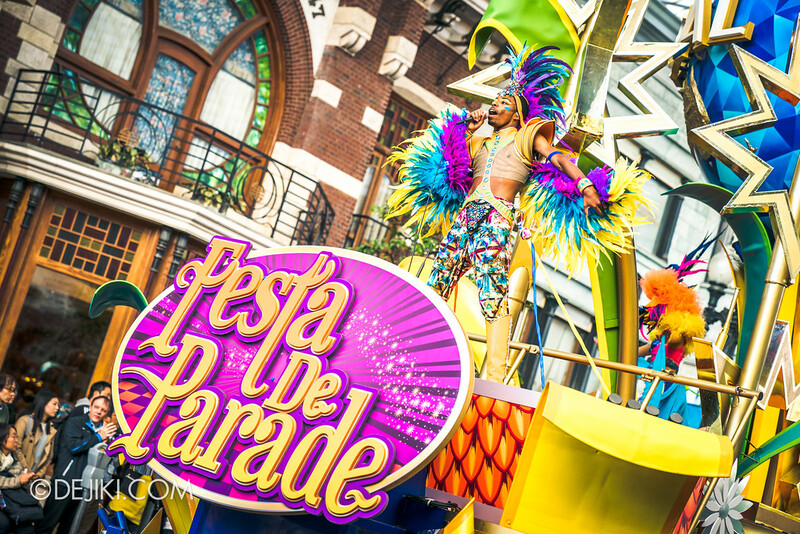 Please note that this parade is very over-the-top and if you are not used to USJ’s excessively dramatic shows, it can be an overwhelming experience. There are constant sprays of confetti, bubbles, foam and ribbons. If you can’t get enough of that then the Special Area promises even more of that. Two greeting shows will be held in the park: Minions Hacha-Mecha Greeting at Minion Park, and the Wonderland Happy Greeting ~Halloween version~ at Universal Wonderland. If you see park staff members wearing pumpkin-shaped slingbags (or leather satchels with a Pumpkin charm at Hogsmeade in The Wizarding World of Harry Potter), you can say “Trick or Treat” to get free candy. Universal Wonderland, the family-friendly zone where Hello Kitty, Sesame Street and Snoopy characters inhabit, will become a Kowa Kawa Halloween area safe from the horrors brewing in other parts of the park. In the evening, be charmed by the all-new Halloween Lights, where the entire area will be made even more adorable with cute lights. Universal Surprise Halloween has started in Japan, and my friend Scott (Yukendoit) has contributed a guest article. Read it here! For this section, the Japanese names of the various ticket types and bundles are included for your reference. The three Halloween events at Universal Studios Japan start from the second weekend of September, and will be available every day till 4 November 2018. To experience Universal Surprise Halloween 2018, you will need an admission ticket (Studio Pass) to enter Universal Studios Japan. A variety of 1-day, 2-day and 1.5-day passes are available, and you can buy them early via Klook Travel as well. While many of the park’s seasonal attractions are included in park admission, the following attractions require special entry tickets to enter. On most days, an entry ticket will be required for Silence in the Ghost Ship and Insidious: The Last Key. If the park isn’t crowded, or after a certain period of time (e.g. at night), the entry ticket may not be used and you will be able to just wait in line for the mazes. As an alternative, you can purchase Express Passes for the Silence in the Ghost Ship and Insidious: The Last Key, which works as entry tickets while significantly cutting waiting time. USJ Halloween Express Passes shorten waiting time to participating attraction – one-time access to the participating attraction per pass. For horror mazes requiring special entry ticket, the Express Pass works as an entry ticket while cutting your wait time. Note: Express Passes have designated timeslots for use at the attractions. Depending on where you buy them (e.g. at USJ’s official website), you may be able to choose the timeslots. When purchasing express passes for a group, you should buy them all together, otherwise the timings may not match up. If you are purchasing different kinds of express passes, be aware that timings may clash and you may miss some attractions. Also, all prices indicated below are starting prices as the passes are more expensive on days where higher park attendance is expected. You can use this link (Japanese only) to check the current stock levels of the various express passes . The total cost of this bundle is at least ¥12,950 (~S$160). One potential problem is ensuring the express passes do not have overlapping timeslots. To avoid this, I would suggest buying express passes at the park (if available) or the park’s official website where you can select from available timeslots. Good news! Klook is now officially selling USJ Halloween Horror Nights Express Passes! The following sets are available. Quantities are limited, so book early before they sell out! These packages cater for young families. Cut the wait time to selected restaurants with these “A Full Day of Kowa Kawa” bundles. You will be given designated express lane timeslots for your chosen restaurant and the Despicable Me: Minion Mayhem attraction. The sets do not include any food and drinks. Please note that these are actually separate sets and you will need to pick the restaurant (the sets are named after the restaurant bundled) when you purchase the passes. Be at the park in the morning and make your way to the entry ticket distribution point for both Silence in the Ghost Ship and Insidious: The Last Key horror mazes to collect entry tickets. They’re both within minutes from one another. Depending on the situation, you may be able to revisit and queue again for more tickets like in 2017. Just don’t be too obvious about this! As Silence in the Ghost Ship is a likely longer and larger experience, you may want to prioritise that. Need help understanding park maps, announcements and Express Passes? Refer to the list below! Also, Halloween attractions open progressively. Don’t be alarmed when you see that certain attractions have mysteriously opened. Due to thematic and extreme content, the following Halloween attractions under the ‘Otona’ and ‘Zekkyo’ Halloween lineup have age restrictions. For these attractions with 12^, children ages 7-11 may enter the attraction if they are accompanied with an adult. Guests are allowed to wear costumes and masks in the park, as long as they abide by the park’s rules. In general, weapon-like objects of all kinds (and of course, actual weapons) are strictly not allowed in the park. Carts, luggage and other bulky items should also not be brought in. In addition, offensive/ obscene clothing are not allowed. The park may request accessories and parts of outfits to be removed at any area of the park and its attractions for safety reasons. This means scary costumes/masks are not be allowed at Universal Wonderland, an themed area for families. Lastly, guests are not allowed to impersonate as park crew and entertainers (scare actors). USJ event visuals © Universal Studios. Thanks for the wonderful guide! I’m super hype for the event! I need some advice. They haven’t start selling the Express Pass for the first day of HHN and I can only be there on that day. Any idea if there are actually Express Passes to be sold for the first day? Glad that you found my guide useful! At the moment, Express Passes for the first week of HHN are not available pre-sales online, they are only available from 14 Sept onwards – and you can only purchase KowaKawa Dining Express, Hotel Albert Experience Pass, and the Festa de Parade Special Area ticket for 8 to 13 Sept. In my past trips, I was able to purchase some Express Passes that were marked as “Sold Out” online at the park gate on the day itself, but not the day before – the ticketing staff said they’re really sold out! It seems that they would only release some passes for sale on same-day basis, subject to the park crowd conditions. Thanks for your detailed overview of the expresses passes for HHN 2018. This will be our first visit to USJ and we wanted to make sure we got everything covered as we only have one day. The express passes only seem to be on sale up until 1st November and we aim to visit on 2nd – any reason why? We planned to get regular express pass for the rides, if you buy HHN express does it include the rides as well? Also, will they go on sale on the English website or can you only get them via the Japanese site? I’m a bit confused. This is an all day event? I’ll coincidentally be in Japan end Oct-early Nov. plan to drop by to Osaka and should be in Osaka from 30/10 to maybe 2/11. Was thinking of going on 31/10 but just remembered that is the day of halloween itself. Was wondering since it is halloween it will be even more full and I should go on the next day instead. Am really looking forward to this. Also my 6th year in a row going to HHN in USS this year in mid October. It is an all-day event with attractions opening and shows happening progressively throughout the day. The park completes its transformation in the evening when park-wide zombie encounters begin. From my experience, Halloween day itself attracts mainly park guests in (quite elaborate) costumes, and they spend most of their time taking photos in the park and enjoying the atmosphere. The attractions wait time was actually slightly shorter. 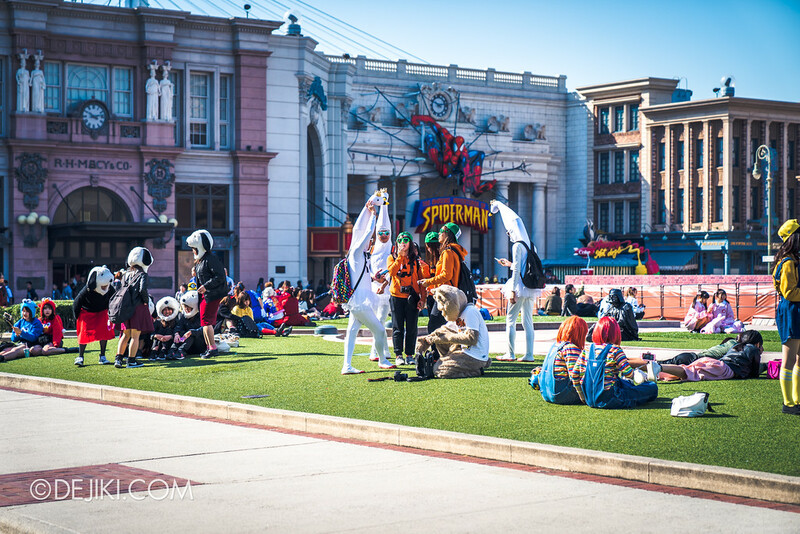 There would also be other Halloween events taking place outside the park which would help reduce the crowd within USJ. As for the other days before and after 31/10, expect typical or higher-than-typical crowds for attractions. Hi! Other than Hotel Albert, can somebody that does not understand Japanese enjoy these Halloween attractions (Silent in the Ghost Ship, Cult of Chucky, Insidious)? Yes, definitely for those attractions you mentioned. For last year’s haunted houses, performers were able to speak simple English (while keeping in character) as part of the experience. Signs in English are also available. Thanks for the great write-up! I’m headed to USJ for the first time want to really soak it all in. Do you know if the Royal Express passes are valid for the haunted attractions? Nope, the USJ Royal Studio Pass only includes Universal Express access for non-Halloween attractions. That’s right. 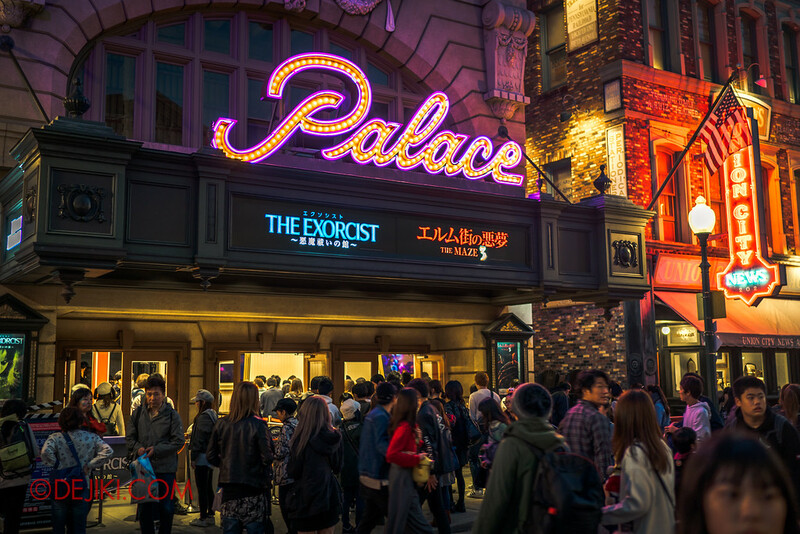 To ensure that park guests can all return home via public transport, USJ’s park hours typically end at 10PM even during Halloween season. Hi, your guide had a lot of useful tips for my trip to Osaka .But i’m still confused on how the Horror night in USJ works.Do we have to get a seperate ticket like how USS works or can we just use the normal entry ticket to experience the Horror Night there? Hi Zul, Halloween attractions are included in regular daytime admission to USJ, with the exception of special experiences that are separately charged (e.g. Hotel Albert). Wonderful info! I am trying to buy advance tickets for HHN for Wedsneday October 17 on the USJ website (Japanese version) but whenever I get to the part to pick timeslots, It doesnt let me choose any times. Just dont want to get to the park and TRY to get tickets seeing as I can only visit one day. Any info on getting express passes/tickets would be helpful! Thanks! Hi, Do you need to know how to speak Japanese to participate in the Halloween Attractions like the maze and the Hotel Albert? As Hotel Albert is an interactive theater experience, you will need to interact with performers in Japanese. It is not needed for the other haunted mazes. Aww. I purchased hotel albert tickets but do not know how to speak japanese. Will i be ok in terms of progressing into the maze? While you will not be able to fully enjoy the story or take part in some of the interactive portions, the performers and crew in the houses will direct you around (like previous TRAUMA series). A great and informative write up that has helped me no end in my planning. The video added an extra element to drive the details home. It looks like you did it without Express Passes, and as we are coming from the UK and only have one day/night to try and experience it all I’m not sure this would be a good idea for us so I am thinking that the Otana and Halloween Horror Night set would work. Can I get these online or do I have to get them at the park on the day? Limited quantities of Express Pass Sets may be available for sale at the park. If you wish to consider buying the passes via Klook online to be safe. Please check this page (https://www.usj.co.jp/parkguide/schedule/jogaibi.html) for black-out dates of the Annual Pass. On other days that you can visit USJ with your Annual Pass, you can stay on for Halloween Horr Nights. For the other Halloween special attraction, do visitors enter by groups or they will be group with other visitors too? Is there anything which would be recommended/avoided if I am going on my own? For horror mazes, you will be let into the houses in small groups to ensure all guests’ safety and enjoyment. You can buy it at the park, but please do so early. But they don’t say how the rules differ. My son will be going dressed as Deadpool, and I want to know if the toy guns will be allowed, and also the foam dagger, and katana handles which fit into the scabbard. They don’t have blades. If anyone can help me out it would save me taking a lot of unnecessary stuff. According to the USJ Halloween microsite (in English: https://www.usj.co.jp/e/halloween2018/#rule), the rule on items resembling weapons still apply. This is highlighted on the Japanese website which states that weapon-like objects, including swords, knives, and guns are forbidden. To avoid hassle, I would suggest not to bring these items to the park. You may be turned away at the park gates, or asked to keep the items in the lockers. There is also another rule about not allowing guests to wear masks that obscure the face completely – this was clearly not enforced last year when I visited. I guess there’s not much point taking the guns (they weren’t allowed into the Comicon we went to today in Shanghai, either), but I’ll risk the other bits. If they don’t let them in It’s a short trip back to the hotel. I’m surprised about the mask – but my son couldn’t wear his for more than a few minutes today, anyway, so it’s not a great loss. Anyway, thank you for your reply. I appreciate it. Hi, I purchased the Otona Halloween Set (Premium), does it give me entry to Hotel Albert’s maze as well? No, the Otona Premium set only includes access to the Hotel Albert Lounge. For the Hotel Albert experience, it is already sold out online via USJ’s official website. Limited quantities may be available on same-day basis at the park. We’re here in Osaka right now and we already have tickets. We want to enjoy USJ but not with too many people so that we will not experience long lines. Which of these 3 dates is the best? Oct 31, Nov 1 or 2? From last year’s experience, 31 Oct will be the least crowded for rides, because: There are other Halloween events happening in Osaka on Halloween night itself. Also, many of the guests are in costume to enjoy the halloween atmosphere, and are therefore less interested in the attractions. Those with elaborate costumes are not even able to enter the haunted houses or rides. The queues for rides will definitely pick up on 1 and 2 Nov, and you would see a lot less people in costumes. Sorry I am new with the USJ and HHR and I don’t really understand everything about this special event! By the way, we will visit USJ on 31 oct this year with my 12-y-o daughter, but we are only interested by the non-Halloween attractions (Harry Potter, Minions…) My question is : we plan to stay as long as we can in the park for enjoying all the normal attractions but at night is it OK (not too scary?) for children to stay in the park or we should leave before 6PM? You are free to stay till late but most of the park’s streets will be filled with performers in scary roles. I would suggest staying within the “safe areas” such as Minion Park and Universal Wonderland (which will have Halloween themed activities suitable for young families). There is a route from the park entrance and these two areas that are marked as “safe areas” and will not have any roaming performers. Feel free to ask me more questions. Hi, thank you for the wonderful guide even though i m a year late, at least i know what to expect, any idea if they have the RIP tour just like how USS has them? I am going there for the first time this year and im super excited!